Ever wonder what it's like getting older? 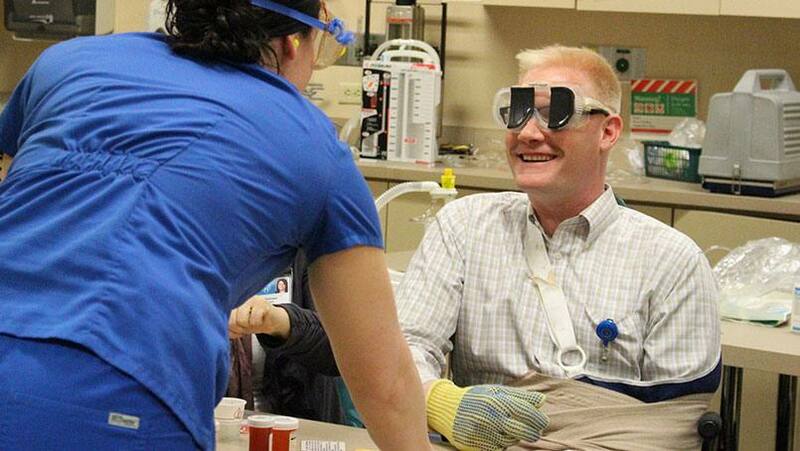 Mayo School of Health Sciences simulated game allows students to personally experience the needs of elderly patients. Officially an “educational collaboration” between the university and Mayo School of Health Sciences, the game is “a simulation designed to allow students to personally experience the losses that occur with aging,” Mayo’s Vanessa King tells UMR News Online. King is the Mayo School of Health Sciences Respiratory Care Program director. The Aging Game, designed by Mayo’s Darryl Chutka, M.D., helps students empathize by giving them a taste of how the older side lives. 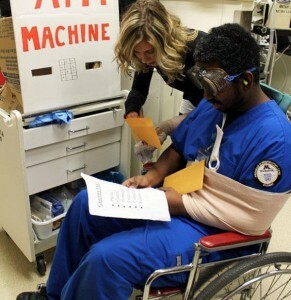 As part of the game, writes reporter Karna Fronden, students have their “mobility, fine dexterity skills, vision and hearing” altered by using “ear plugs, modified goggles, gloves, and leg braces” to help them better understand the limitations of some elderly patients. The students “are also given a card explaining their disabilities and life events, a small amount of money, and white chips representing their self-esteem.” They’re then given 90 minutes to complete a few simple, everyday tasks like “grocery shopping, stopping at the bank and post office, and eating lunch at a restaurant,” while working in pairs.